Earlier today, the world's most powerful particle accelerator began its second act. After two years of upgrades and repairs, proton beams once again circulated around the Large Hadron Collider, located at the CERN laboratory near Geneva, Switzerland. These collisions – hundreds of millions of them every second – will lead scientists to new and unexplored realms of physics, and could yield extraordinary insights into the nature of the physical universe. A highlight of the LHC's first run, which began in 2009, was the discovery of the Higgs boson, the last in the suite of elementary particles that make up scientists' best picture of the universe and how it works. The discovery of the Higgs was announced in July 2012 by two experimental collaborations, ATLAS and CMS. Continuing to measure the properties of the Higgs will be a major focus of LHC Run 2. "The Higgs discovery was one of the most important scientific achievements of our time," said James Siegrist, the U.S. Department of Energy's Associate Director of Science for High Energy Physics. "With the LHC operational again, at even higher energies, the possibilities for new discoveries are endless, and the United States will be at the forefront of those discoveries." During the LHC's second run, particles will collide at a staggering 13 teraelectronvolts (TeV), which is 60 percent higher than any accelerator has achieved before. The LHC's four major particle detectors – ATLAS, CMS, ALICE and LHCb – will collect and analyze data from these collisions, allowing them to probe new areas of research that were previously unattainable. The U.S. contingent was part of an estimated 10,000 people from 113 different countries who helped to design, build, and upgrade the LHC accelerator and its four particle detectors. "We are on the threshold of an exciting time in particle physics: the LHC will turn on with the highest energy beam ever achieved," said Fleming Crim, National Science Foundation Assistant Director for Mathematical and Physical Sciences. "This energy regime will open the door to new discoveries about our universe that were impossible as recently as two years ago." In addition to the scientists pushing toward new discoveries on the four main experiments, the U.S. provides a significant portion of the computing and data analysis – roughly 23 percent for ATLAS and 33 percent for CMS. U.S. scientists on the ALICE experiment developed control and tracking systems for the detector and made significant contributions in software, hardware and computing support. US scientists also helped improve trigger software for data analysis for the LHCb experiment. U.S. institutions will continue to make important contributions to the LHC and its experiments, even beyond the second run, which is scheduled to continue through the middle of 2018. 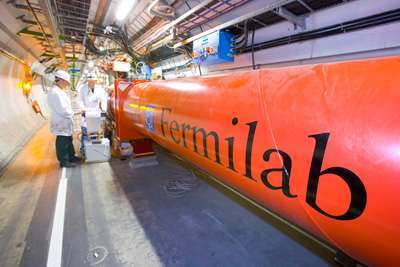 Universities and national laboratories are developing new accelerator and detector technology for future upgrades of the LHC and its experiments. This ongoing work encourages a strong partnership between science and industry, and drives technological innovation in the United States. "Operating accelerators for the benefit of the physics community is what CERN's here for," said CERN Director General Rolf Heuer. "Today, CERN's heart beats once more to the rhythm of the LHC." How will they contain any mini black holes that they manufacture ? And when it's turned off, will such a mini black hole simply fall down through the walls of the collider toward the center of the earth whereupon, it will proceed to consume the Earth ? Shouldn't this experiment be performed on the moon, where, if consumed by a manufactured black hole, it would have no effect on our tides ? And, if scientists know that any mini blackholes they manufacture will just "evaporate" away, doesn't that mean that they know the results of the experiment before they perform the experiment ? Who's kidding whom ? I think the experiment is just to dangerous (here on Earth, anyway).